Buy Bulk Custom Footed Goblets today. 11.75 oz. 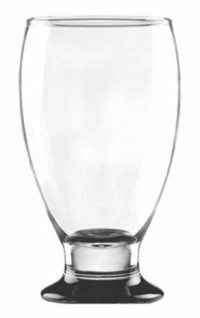 This 11.75 ounce footed goblet is perfect for a beer pour with a foamy head. It comes packaged 48 per case and can be custom engraved, imprinted, etched or decaled with your custom branding. If your business doesn't have a logo yet, you can work with the design and branding professionals at Deja Brew USA to invent your perfect brand.